Indian team played their heart out against Malaysian opponents and won 2-0 in best-of-three men's squash final. Saurav Ghosal and Harinder Pal Sandhu played their hearts out against tough Malaysian opponents and won 2-0 in the best-of-three men’s squash title contest to provide India with their second gold of the day in the 17th Asian Games on Saturday. Sandhu pulled off a shocker when he upset Mohd Azlan Iskandar, who had won the singles gold four years ago at Guangzhou, in four games after playing like a man possessed. Sandhu played some very good shots from the forecourt and used the side walls beautifully to carve out a 3-1 victory (11-8, 11-6, 8-11, 11-4) in two minutes under an hour to give India a great 1-0 start. Ghosal won 6-11, 11-7, 11-6, 12-14, 11-9 after an 88-minute marathon battle where no quarters were given and none asked for by either rival. Ghosal dropped the opener in 17 minutes after scores were level at 5, and then won the second in 12 minutes after taking a commanding 8-3 lead and levelled the set scores. The Kolkata-born looked in good touch as he raced to win the third in just 12 minutes when world no 35 Beng Hee made a fightback. From 4-all, the Malaysian held the lead which he did not relinquish till 11-all and then held match-ball at 12-11 but lost the game in extra points as he had done in the third game against Abdullah two days ago. However, he was determined this time around he would not allow the prize to slip away and though Ong Beng Hee tried hard to unsettle him, the Indian managed to stave off the danger and went to match-ball at 10-8. The Malaysian saved one point but then found no answer to the second. Later Ghosal said he was glad that in the team championship he could do what he could not achieve in the individual gold medal contest on September 25. “I wanted to win this for the team after losing the final earlier. It was a tough game but I am glad I could achieve it,” said the world no 16. Delia Arnold gave Malaysia the lead when she defeated a fighting Anaka Alankamony 3-0 (11-9, 12-10, 11-2) in 43 minutes, the Indian girl fighting hard in the first two games before losing steam in the third. Nicol David, then, expectedly got the better of India’s no 1 player Dipika Pallikal 3-0 (11-7, 11-6, 11-3) in 29 minutes to clinch the gold medal. 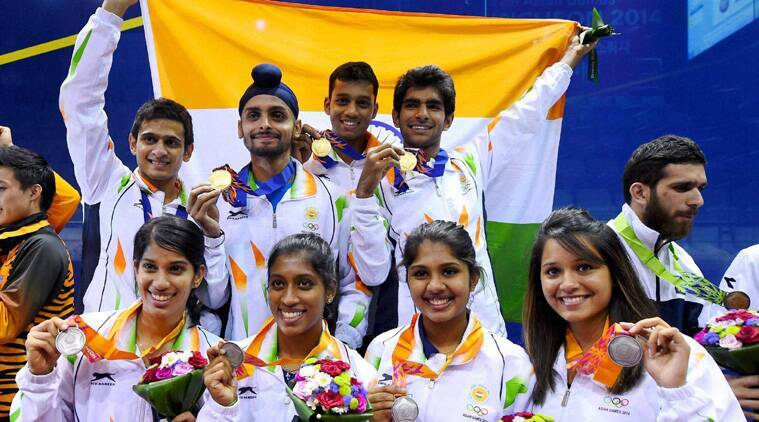 India, thus, emerged with a total haul of one gold, two silver and one bronze from the Games, their best show thus far. Ghosal said though he was very happy to have won the gold for the team, he was yet to get over the disappointment of losing the individual yellow metal after having it virtually in both his hands. “I am very happy for the entire team. But I am yet to get over the disappointment of losing the individual gold. It would have been two gold medals (for me),” he said when asked whether he was happy to go back with one gold and one silver to his name. Sandhu, who hails from Chandigarh but is now based in Chennai with the Indian Squash Academy, said it was “the biggest moment of my life”. He said he was not under pressure “as I was playing the first match of the tie”. “I knew the whole team was looking up to me to give the lead,” he added. N Ramachandran, Indian Olympic Association’s President and patrol of the Squash Rackets Federation of India, expressed his happiness at today’s performance. “I want to congratulate all the medallists from India, including from squash which has always been close to my heart,” he told PTI. Asked whether the general performance of the Indian contingent has come as a disappointment with the country lagging behind in medals tally, Ramachandran said that we will “have to wait till the Games are over”.